This article is about the former Prince of Wales and Jacobite Pretender. For his half-brother, see James Stuart, Duke of Cambridge. 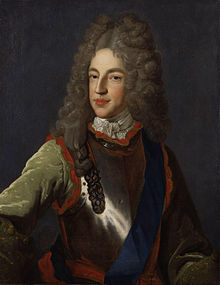 James Francis Edward Stuart (10 June 1688 – 1 January 1766), nicknamed The Old Pretender, was the son of King James II and VII of England, Scotland and Ireland, and his second wife, Mary of Modena. 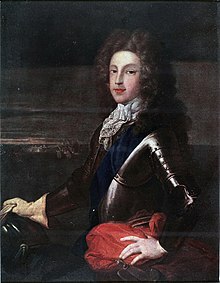 He was Prince of Wales from July 1688, until just months after his birth, his Catholic father was deposed and exiled in the Glorious Revolution of 1688. James II's Protestant elder daughter, Mary II, and her husband, William III, became co-monarchs and the Bill of Rights 1689 and Act of Settlement 1701 excluded Catholics from the British throne. James Francis Edward was raised in Continental Europe. 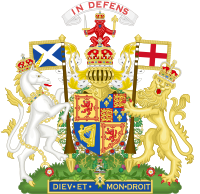 After his father's death in 1701, he claimed the English, Scottish and Irish crown as James III of England and Ireland and James VIII of Scotland, with the support of his Jacobite followers and his cousin Louis XIV of France. Fourteen years later, he unsuccessfully attempted to gain the throne in Britain during the Jacobite rising of 1715. Following his death in 1766, his elder son, Charles Edward Stuart, continued to claim the British crown as part of the Jacobite Succession. James Francis Edward was born 10 June 1688, at St. James's Palace. 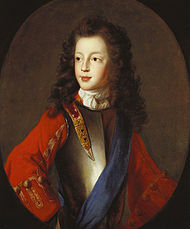 He was the son of King James II of England and Ireland (VII of Scotland) and his Roman Catholic second wife, Mary of Modena, and, as such, was automatically Duke of Cornwall and Duke of Rothesay, among other titles. The prince's birth was controversial and, coming five years after his mother's last conception, unanticipated on the part of a number of British Protestants, who had expected his sister Mary, from his father’s first marriage, to succeed their father. Mary and her younger sister Princess Anne had been raised as Protestants. As long as there was a possibility of one of them succeeding him, the king's opponents saw his rule as a temporary inconvenience. When people began to fear that James's second wife, Mary, would produce a Catholic son and heir, a movement grew to replace him with his elder daughter Princess Mary and his son-in-law/nephew, William of Orange. When the prince was born, rumours immediately began to spread that he was an impostor baby, smuggled into the royal birth chamber in a warming pan and that the actual child of James and Mary was stillborn. In an attempt to scotch this myth, James published the testimonies of over seventy witnesses to the birth. On 9 December, in the midst of the Glorious Revolution, Mary of Modena disguised herself as a laundress and escaped with the infant James to France. Young James was brought up at the Château de Saint-Germain-en-Laye, which Louis XIV had turned over to the exiled James II. Both the ex-king and his family were held in great consideration by the French king (who was his first cousin), and they were frequent visitors at Versailles where Louis XIV and his court treated them as ruling monarchs. In June 1692 his sister Louisa Maria was born. His military education was overseen by Richard Hamilton and Dominic Sheldon, two veterans of his father's old Irish Army. On his father's death in 1701, James was recognised by King Louis XIV of France as the rightful heir to the English, Irish and Scottish thrones. Spain, the Papal States, and Modena also recognized him as King James III of England, Ireland and VIII of Scotland and refused to recognise William III, Mary II, or Anne as legitimate sovereigns. As a result of his claiming his father's lost thrones, James was attainted for treason in London on 2 March 1702, and his titles were forfeited under English law. Though delayed in France by an attack of measles, James attempted invasion, trying to land at the Firth of Forth on 23 March 1708. The fleet of Admiral Sir George Byng intercepted the French ships, which, combined with bad weather, prevented a landing. James served for a time in the French army, as his father had done during the interregnum. Between August and September 1710, Queen Anne appointed a new Tory administration led by Robert Harley, who entered into a secret correspondence with de Torcy, the French Minister of Foreign Affairs, in which he claimed to desire James's restoration to the throne should James convert to Protestantism. A year later, however, the British government pushed for James's expulsion from France as a precondition for a peace treaty with France. In accordance with the Treaty of Utrecht (1713), Harley and Lord Bolingbroke, the Secretary of State, colluded with the French in exiling James to the Duchy of Lorraine. Queen Anne became severely ill at Christmas 1713 and seemed close to death. In January 1714, she recovered but clearly had not much longer to live. Through de Torcy and his London agent, Abbé François Gaultier, Harley kept up the correspondence with James, and Bolingbroke had also entered into a separate correspondence with him. They both stated to James that his conversion to Protestantism would facilitate his restoration. However, James, a devout Catholic, replied to Torcy: "I have chosen my own course, therefore it is for others to change their sentiments." In March came James's refusal to convert, following which Harley and Bolingbroke reached the opinion that James's restoration was not feasible, though they maintained their correspondence with him. As a result, in August 1714, James's second cousin, the Elector of Hanover, George Louis, a German-speaking Protestant who was the closest Protestant relative of the now deceased Queen Anne, became king of the recently created Kingdom of Great Britain as George I. James denounced the new King, noting "we have beheld a foreign family, aliens to our country, distant in blood, and strangers even to our language, ascend the throne." Following George's coronation in October 1714, major riots broke out in provincial England. The Old Pretender lands in Scotland after Sheriffmuir. An 18th-century engraving. The following year, Jacobites started uprisings in Scotland and Cornwall aimed at putting "James III and VIII" on the throne. On 22 December 1715, James reached Scotland after the Jacobite defeats at the Battle of Sheriffmuir (13 November 1715) and Preston. He landed at Peterhead and soon fell ill with fever, his illness made more severe by the icy Scottish winter. In January 1716, he set up court at Scone Palace, but learning of the approach of government forces, returned to France, sailing from Montrose on 5 February 1716. 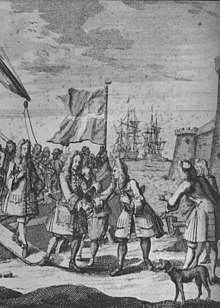 The abandonment of his rebel allies caused ill-feeling against him in Scotland; nor was he welcomed on his return to France. His patron, Louis XIV, had died on 1 September 1715, and the French government found him a political embarrassment. After the unsuccessful invasion of 1715, James lived in Papal territory, first at Avignon (April 1716–February 1717), then at Pesaro (1717) and Urbino (July 1717–November 1718). Pope Clement XI offered James the Palazzo del Re in Rome as his residence, which he accepted. Pope Innocent XIII, like his predecessor, showed much support. Thanks to his friend Cardinal Filippo Antonio Gualterio, James was granted a life annuity of eight thousand Roman scudi. Such help enabled him to organise a Jacobite court at Rome, where, although he lived in splendour, he continued to suffer from fits of melancholy and depression. Further efforts to restore the Stuarts to the British throne were planned. In 1719 a major expedition left Spain but was forced to turn back due to weather. A small landing took place in the Scottish Highlands, but the Jacobite rising of 1719 was defeated at the Battle of Glen Shiel. James had gone to Spain in the hope he could take part in the invasion, but following its abandonment was forced to return to Italy. A further attempt was planned in 1722, but following the exposure of the Atterbury Plot it came to nothing. In exercise of his pretended position, James purported to create titles of nobility, now referred to as Jacobite Peerages, for his English supporters and members of his court, which, of course, were not recognised in England. The Court in Exile became a popular stop for English travelers making a Grand Tour, regardless of political affiliation. For many, it functioned as an unofficial embassy. Those in need of medical attention preferred being treated by one of their own countrymen. In 1735, court physicians tended to Edmund Sheffield, 2nd Duke of Buckingham and Normanby and to James Boswell thirty years later. The court wine steward operated a lucrative business in selling rare vintages to visitors. After the Bourbons seized Naples in 1734, an appropriate introduction was essential for anyone wishing entry to an important concert or salon. James remained well-treated in Rome until his death. He was allowed to hold Protestant services at Court, and was given land where his Protestant subjects could receive a public burial. Security was provided to discourage British spies. Louise Adélaïde d'Orléans (Mademoiselle d'Orléans), daughter of Philippe II, Duke of Orléans, was at one time suggested as a wife for James, but nothing came of it. In March 1717, while James was visiting Modena, he became engaged to his cousin Benedetta d'Este, but her father Rinaldo III put an end to the engagement to preserve his relations with Hanover and Great Britain. Charles Edward Stuart (31 December 1720 – 31 January 1788), nicknamed "Bonnie Prince Charlie"
Following James's failure, attention turned to his son Charles, "the Young Pretender", who led a doomed rebellion in 1745. With the failure of this second rebellion, the Stuart hopes of regaining the British throne were effectively destroyed. James and Charles later clashed repeatedly, and relations between them broke down completely when James played a role in the appointment of his son Henry as a cardinal. Henry then took holy orders, which required him to maintain celibacy, ending the possibility that he would produce a legitimate heir, infuriating Charles, who had not been consulted. In 1759, the French government briefly considered a scheme to have James crowned King of Ireland as part of their plans to invade Britain, but the offer was never formally made to James. Several separate plans also involved Charles being given control of a French-backed independent Ireland. Tomb of James Francis Edward Stuart and his two sons in St. Peter's Basilica. James died in Rome on 1 January 1766 in his home, the Palazzo Muti, and was buried in the crypt of St. Peter's Basilica in present-day Vatican City. His burial is marked by the Monument to the Royal Stuarts. His claimed reign had lasted for 64 years, 3 months and 16 days, longer than any British monarch until Queen Elizabeth II's reign surpassed it on 23 May 2016. Following James's death the pope refused to recognise the claim to the British and Irish thrones of his elder son Charles; instead, from 14 January 1766, he finally accepted the Hanoverian dynasty as the legitimate rulers of Britain and Ireland. This decision led to a gradual relaxation and reform of the anti-Catholic "Penal laws" in Britain and Ireland. In 1792, the Papacy specifically referred to George III as the "King of Great Britain and Ireland", which elicited a protest from James's younger son Henry, who was then the Jacobite claimant. James was created Prince of Wales on 4 July 1688. As Prince of Wales, James bore a coat of arms consisting of those of the kingdom, differenced by a label argent of three points. James was portrayed by Freddie Wilson in the highly regarded BBC serial The First Churchills. In A Spectacle of Corruption by David Liss, James III and the Jacobites plays a key role in the plot. Wikimedia Commons has media related to James Francis Edward Stuart. ^ a b c ""Prince James Francis Edward", The British Monarchy". Archived from the original on 4 March 2016. Retrieved 30 October 2015. ^ a b c ""James Francis Edward Stuart", The Stuart Succession Project, University of Exeter". Archived from the original on 4 March 2016. Retrieved 30 October 2015. ^ a b c d James Edward Gregg, 'James Francis Edward (1688–1766) Archived 29 January 2017 at the Wayback Machine', Oxford Dictionary of National Biography, Oxford University Press, 2004; online edn, May 2012, accessed 23 June 2013. ^ Depositions Taken the 22d. of October 1688. before the Privy-Council and Peers of England; Relating to the Birth of the (then) Prince of Wales. Published by His Majesty's Special Command, [Edinburgh]: [Printed by the heir of Andrew Anderson], 1688, OCLC 606591965 . ^ Frequent mentions throughout the Duke of Saint-Simon's Mémoires. 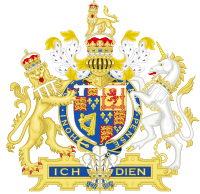 ^ Complete Peerage: "Duke of Cornwall". ^ a b c ""James Francis Edward Stuart, styled James VIII and III", The University of Nottingham". Archived from the original on 4 March 2016. Retrieved 30 October 2015. ^ Simms, Brendan. Three Victories and a Defeat: The Rise and Fall of the First British Empire, 1714–1783. Penguin, 2008. ^ Bevan (1967), pp. 92, 96. ^ Bevan (1967), p. 99. ^ Bevan (1967), pp. 102, 110. ^ Corp, Edward (2010). The Location of the Stuart Court in Rome: The Palazzo Del Re. Basingstoke: Palgrave Macmillan. pp. 180–205. ^ a b Corp, Edward T. (2011). The Stuarts in Italy, 1719–1766. Cambridge University Press. ISBN 9780521513272. ^ Bevan (1967), pp. 98-99, 103. ^ "Famous Stewarts". www.stewartsociety.org. Archived from the original on 10 May 2017. Retrieved 20 May 2016. ^ Vaughan, Herbert (1906). The Last of the Royal Stuarts: Henry Stuart, Cardinal Duke of York. London: Methuen. pp. 212–214. Archived from the original on 7 September 2011. Retrieved 23 August 2011. ^ "The Prince of Wales – Previous Princes". Princeofwales.gov.uk. Archived from the original on 11 October 2008. Retrieved 2 May 2010. ^ Francois R. Velde. "Marks of Cadency in the British Royal Family". Heraldica.org. Archived from the original on 13 March 2017. Retrieved 2 May 2010. Bevan, Bryan (1967). King James the Third of England: A Study of Kingship in Exile. London: Robert Hale. This page was last edited on 20 April 2019, at 06:08 (UTC).